This unique new SOR Vinyl Sand Mat is designed to protect the interior of your vehicle and keep your factory carpeting looking like new. 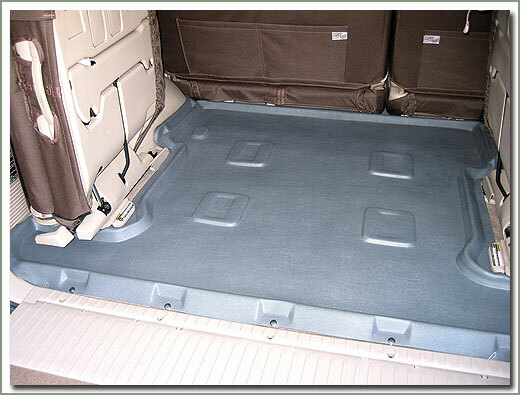 These revolutionary new SOR Vinyl Sand Mats are molded to the individual contours of the floor with raised edges that catch dirt and sand carried into the car by your feet. Easy to remove from the vehicle for cleaning. Securely positioned with carpet lock screws and side lock clips along the door sills, not just a drop-in liner. These will not move around under your feet while driving. Made of durable, heavy gauge molded vinyl, that provides temperature insulation and noise reduction features. These mats are not the thin flimsy thermoplastic liners. The front set consists of front driver's mat, front passenger mat, and mid passenger mat. Has a heel pad on driver's side for extended wear. SOR Rear Cargo Mat sold separately. Available for 60, 62, 80 & 100 Series.